OSWEGO, NY â€“ Would you like to find a way to keep cool this summer?. Perhaps youâ€™re looking for a way to put a little spring in your step when you exercise. Maybe you just want to be able to eat an entire ice cream cone before the treat turns into a gooey, sticky mess in your hand. Some elementary students just might have what youâ€™re looking for. Alex Flack explains his project to judge Diane Jackson. Trinity Catholic School held its Invention Convention science fair recently.Â Students put their science skills as well as their imagination on display in the school gym. 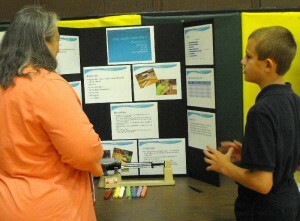 Diane Jackson (of SUNY Oswego) was a judge for the science projects. Mary Bornheimer invented a fan hat. The fourth graderâ€™s ball cap design had a pair of small fans that were attached to the end of the bill. Annie Seo, another fourth grader, came up with the idea for a spring powered exercise shoe. 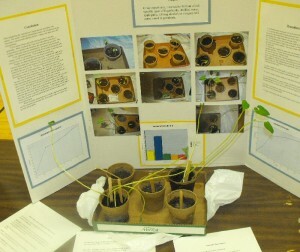 Fifth grader Phillips Cummingsâ€™ project looked at the effects of different liquids on seeds. After completing the experiment, he found that his hypothesis was correct. The seeds he â€œwateredâ€ with cola and distilled water would germinate, and those he used apple juice, vinegar and rubbing alcohol didnâ€™t. â€œWhen the planted seeds started growing, both the distilled water plants and the cola plants grew faster the first couple of days and then their growth slowed down,â€ he pointed out. Plants, at various stages of growth, are seen in Phillips Cummingsâ€™ project. Sixth grader Alex Flack did a project to determine whether the color of a candle had any effect on how quickly it burned down. His classmate, Anton Porcari, wanted to see how good peopleâ€™s sense of smell really is. He placed five everyday ingredients in containers and listed six options for each. People sniffed and tried to identify the mystery item. His conclusion was â€œvery far off from my hypothesis,â€ he said. Some of his choices â€“ a tangerine or orange, scallions or onions for example – were a bit tricky, he admits. Kaitlynn Todd made a solar panel out of used soda cans. â€œI wanted to see if I could generate heat using items from around the house without using electricity, thereby saving money for my family,â€ the fifth grader explained. She created a panel with six cans across and four cans down; the cans were spray painted black. She placed the contraption outside in the sun and hooked it to a thermometer in the basement. The basement started at 56 degrees, and within 10 minutes the room temperature was up to 65 degrees and the next day it reached a high of 85 degrees, she noted. The panel could be created larger to generate more heat if needed, she added. The room cooled overnight and warmed up the next day when the sun came out, she said. Lynch Rabyâ€™s project was to determine which milk goes bad first. He studied skim, two percent and whole milk. â€œSkim milk lasted the longest. The two percent was next and whole milk went bad the quickest,â€ he noted. Another sixth grader, Ana Alcasid, wanted to see how well people could tell time â€“ without a clock. Using a stop watch, she timed subjects to see how close theyâ€™d come to determining when one minute had elapsed. The older people tested had a larger percent of error than others, she said. Classmate Clare Donovan experimented to see which battery would last the longest in a flashlight (if left on). 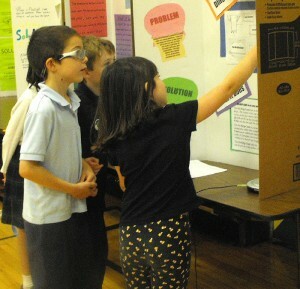 A group of students check out a classmateâ€™s science project in the Trinity school gym. She tested Duracell and Energizer batteries. â€œWhat did you learn from that?â€ Jackson asked. Some of the other projects and inventions included a no-drip ice cream cone (with flavored edible sides), a wind-powered flashlight, the perfect pickle server, a notched hockey stick grip, a pet food bag spout to make serving easier, and a lighted camperâ€™s jacket. Trinity is the sole Catholic school in Oswego County. For more information, call 343-6700.